Objective: Liver retraction for Single Port Laparoscopic Surgery (SPLS) poses a problem which is often resolved by creating a further abdominal wound for a conventional laparoscopic retractor. This clearly compromises the original intent of SPLS which aims to reduce scarring and post operative pain induced from multiple abdominal wounds. In this contribution, the problem is addressed by developing and evaluating a compact system for retraction and surgical exposure specifically for the SPLS technique, thus eliminating the necessity for additional abdominal wounds. At this stage of development, the system has been evaluated for the procedure of SPLS cholecystectomy. Method: A new patented retraction system has been developed in which target tissue is retracted by tethering it to the abdominal wall. The system consists of (a) a holding piece, placed on the outside of the body, that has a Veress type needle projection (2mm) with an inner chamber for storing and guiding the tether; (b) detachable/recoverable latching grasper (with a needle on the top jaw), controlled by a 5mm delivering instrument. The latching grasper is fixed on the gall bladder, thereafter the tether is connected to the latch and needle is removed from the cavity. By manually increasing the tension on the tether the gall bladder is retracted to the abdominal wall and the tether is clamped externally against the abdomen. The system has been evaluated in porcine models the observations of which are presented in this paper. 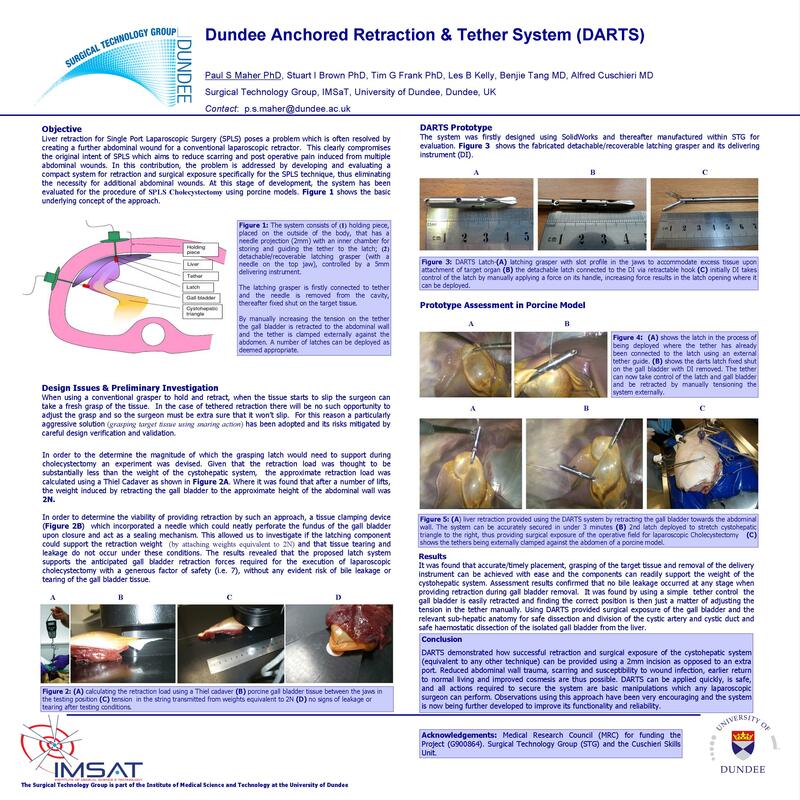 Results: It was found that accurate/timely placement, grasping of the target tissue and removal of the delivery instrument can be achieved with ease and the components can readily support the weight of the cystohepatic system. Although the latch intentionally perforates the gall bladder, experimental results confirmed that no bile leakage occurred at any stage of retraction, nor when the gall bladder was being orientated and pressurised via grasper manipulations. It was also shown that the previously perforated region of the gall bladder tissue does not elongate under the applied load of the cystohepatic system. Using DARTS provides excellent exposure of the cystic artery and cystic duct. Conclusion: DARTS demonstrated how successful retraction and surgical exposure of the cystohepatic system (equivalent to any other technique) can be provided using a 2mm incision as opposed to an extra port. Reduced abdominal wall trauma, scarring and susceptibility to wound infection, earlier return to normal living and improved cosmesis are thus possible. DARTS can be applied quickly, is safe, and all actions required to secure the system are basic manipulations which any laparoscopic surgeon can perform. Observations using this approach have been very encouraging and the system is now being further developed to improve its functionality and reliability.